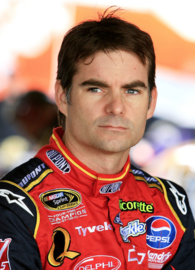 Jeffery Michael "Jeff" Gordon (August 4, 1971-Present) is an American professional stock car racing driver and Fox Nascar announcer. When he was 16, Gordon became the youngest driver to be awarded a USAC license. Gordon drove Hendrick Motorsports No. 24 Chevrolet in 23 full-time NASCAR Sprint Cup Series seasons from 1993 to 2015, after which Gordon chose to step back from full time driving, focusing instead on broadcasting. In 2014, the Diecast Hall of Fame recognized Gordon's success in the industry and awarded him with a Lifetime Achievement Award.